DaVinci Resolve is, of course, one of the world’s preeminent color grading environments which also includes professional editing, audio mixing and media management. It is used on all sorts of projects such as commercials, music videos, television shows and blockbuster feature films. While DaVinci Resolve (free) and DaVinci Resolve Studio (whose price has recently been dramatically lowered to a remarkably affordable $299) can be used with a mouse, serious colorists turn to dedicated control panels to do their work, something they consider a must-have accessory. Compared to a humble mouse and keyboard, a control panel allows for more precise control, improved creativity, and enhanced productivity. For years now, colorists working in DaVinci Resolve Studio could use Blackmagic’s DaVinci Resolve Advanced Panel. At $29,995, the impressively large DaVinci Resolve Advanced Panel is not cheap, but it is comprehensively full-featured and extremely high quality. For serious color facilities, it will pay for itself in a few jobs. 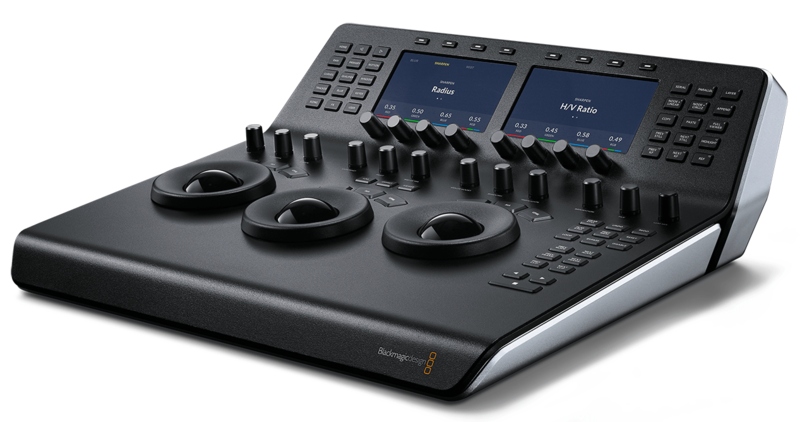 Blackmagic Design’s Advanced Panel has always offered serious colorists a great panel for working with DaVinci Resolve, though it was not exactly cheap. However, for those who don’t have around 30 Grand to drop on a console (such as freelancers or small, one man shops), there were cheaper options including the Tangent Wave panel, which, for around $1,500 gave you a set of trackerballs, knobs and buttons to use with DaVinci Resolve or DaVinci Resolve Studio and was a popular choice for colorists who could not afford the DaVinci Resolve Advanced Panel. Things changed last March, however, when Blackmagic introduced two important new portable control panels for DaVinci Resolve and DaVinci Resolve Studio, the DaVinci Resolve Micro Panel and the DaVinci Resolve Mini Panel. Recently, I had the opportunity to evaluate the DaVinci Resolve Mini Panel (the more fully featured of the two) for a couple of weeks. Here are my thoughts on it. The DaVinci Resolve Mini Panel arrived in an attractive box with a carrying handle on the top. Clearly, the box was meant to be used as a carrying case should you wish to bring it along the with you. This is useful for freelancers and individuals who may wish to take the panel to their next gig or for on-set color correction. While the DaVinci Resolve Mini Panel is not exactly light, it should be no problem taking it around. The Mini Panel comes in a box that can be used by freelancers as a carrying case. 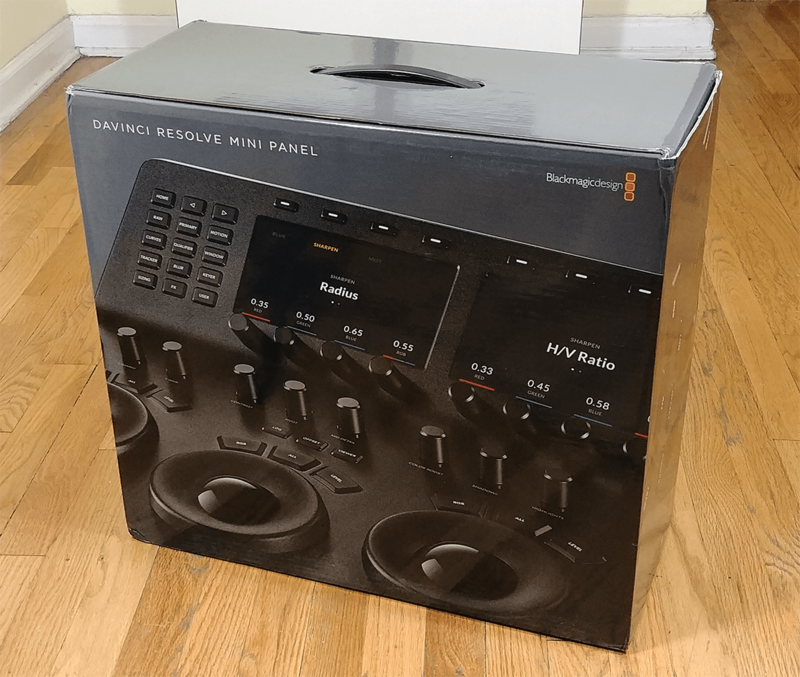 In fact, one of the first things that becomes apparent when opening the box is just how solid and sturdy the DaVinci Resolve Mini Panel is, a good thing for a machine that has the potential of becoming your center of operations. Its heavy-duty metal enclosure feels like it can survive a fall from the Empire State Building (well, maybe not from the top floor). It’s also an impressively handsome machine. You’re sure to look like a color-correcting pro as you sit behind it on your next assignment spinning the various trackballs and knobs. A console will also give you extra clout in the minds of your clients and, as an added bonus, you may be justified in charging a few extra bucks thanks to the “professional factor” it lends to the equation. The three high quality trackballs feel exceptionally good under your fingers and allow you to manipulate multiple parameters of the image at once such as gamma, lift and gain as well as color balance. Using the trackballs (as well as the various precision control knobs) to color grade your footage, becomes quite natural and opens up a lot of creative possibilities that you don’t get when using a mere mouse. Think of it like trying to give someone a massage with your pinky as opposed to getting a grip on someone’s back with both of your hands. It’s just not the same. Using a control panel to color correct provides a fluid, hands-on experience that enhances your creativity because you can adjust multiple parameters at the same time. deliver precise control and a hands-on feel while grading. The high-resolution trackballs on the DaVinci Resolve Mini Panel feel great under your hands and provide RGB balance adjustments for lift, gamma and gain, each with a master level control set via a movable outer trackball ring. The primary knobs on the console can be used to control Y Lift, Y Gamma, Y Gain, Contrast, Pivot, Mid-tone Detail, Color Boost, Shadow, Highlight, Saturation, Hue Rotation and Luminance Mix. Other control knobs allow for super fine control over adjustments and can be pressed to quickly reset a parameter. In addition, buttons are illuminated which makes it easy to see what you are doing and which controls are active, even when the lights are low. As Professional editing continues to become central to DaVinci Resolve, Blackmagic Design’s new panels includes features, not only for color correction, but to help with editing as well. while using the Mini Panel to grade. One of the major differences between the DaVinci Resolve Mini Panel and the smaller DaVinci Resolve Micro Panel, besides the size, are two high resolution LCD screens which contains loads of menus that allow access to many of the advanced color grading features of the software. They display information and parameter settings for the tool that you’re currently working with and change context depending on what you’re doing. Naturally, all the panel’s controls and functions are especially useful when used in conjunction with DaVinci Resolve’s various scopes such as RGB Parade and vectorscope to correct problematic footage as well as achieve creative looks. On the right side of the panel are a wide range of transport and grading control buttons that allow for quick access to commonly used commands, making it much easier than hunting through menus and palettes for a particular setting. There are also dedicated keys for working with nodes, grabbing stills and navigating the timeline. You can add points on a curve and adjust them as well as work with power windows without your hands ever leaving the console. 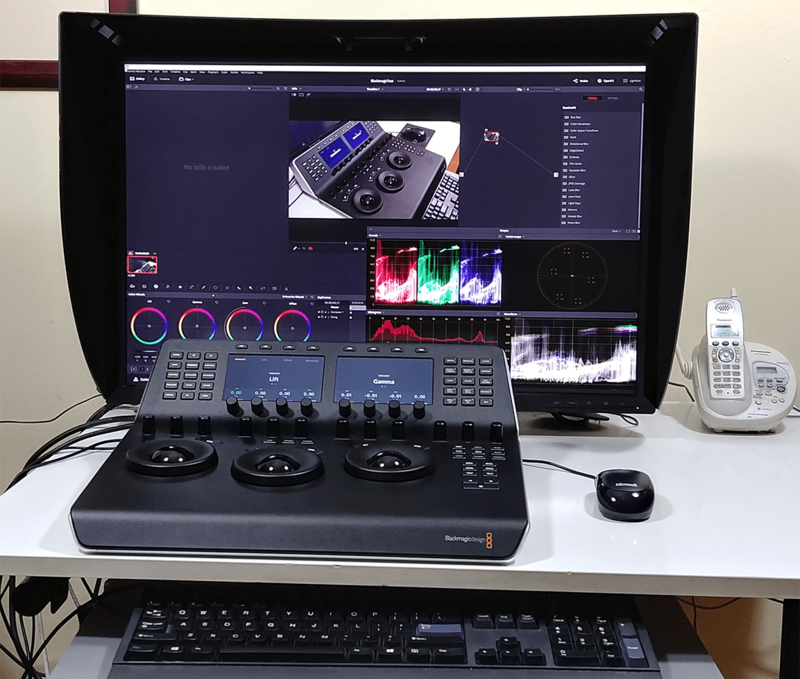 Almost everything important can be done with the DaVinci Resolve Mini Panel and Blackmagic Design continues to expand the capabilities of the machine. Connecting the Mini Panel requires a USB-C cable (included) and a power chord. If you’re serious about color grading, you should consider adding a DaVinci Resolve Mini Panel to your DaVinci Resolve workflow. Its three high-resolution weighted trackballs, 12 control knobs, 18 dedicated navigation and transport keys and its two 5” LCD screens (as well as other controls) will help you be more effective and creative in your color grading work. At $2,995, the panel is also a good value. It’s much cheaper than the advanced panel and is of significant higher quality than other third-party consoles at comparable prices. Joe Herman is a filmmaker, artist and post production specialist and writes often about the industry. You can reach him at joe[at]legendmultimedia[dot]com. Or reach and follow him on Twitter @JoeHermanTweets.